Your adult child just graduated from college. He isn’t sure he knows what to do, and he is asking you for money every few weeks. How do you cut the purse strings and teach him to be independent? Be There— While I am not recommending that you are there with open wallet any time your adult child has a financial crisis, you can and need to be there to listen and offer advice where it is required. Helping your adult child out by listening and providing emotional support is just as important and better for them in the long run. Remember back to your own early days out on your own. It may have been hard, you may have “borrowed” an awful lot shampoo from your roommate, but you survived it, and your adult child will too. Gone, but Not Gone— What about the adult child who IS out on her own, but is still relying on mom and dad for financial assistance? Perhaps the job doesn’t pay enough for rent, utilities, car payment, and insurance. Continuing to pay for things like car and health insurance can actually help the adult child out in the long run; lower premiums and deductibles are in place when an young adult remains on the parents’ policies. (Of course, some companies - mostly health insurance companies - require that the adult child be enrolled in college full-time. It’s worth the effort to check this out!) If she can’t afford to pay the premiums, then she might be able to work it off – painting her old room, helping take care of grandma’s yard, cleaning out the garage, etc. The important thing is to remember that you are trying to teach financial independence and responsibility, not bank-roll her life. It’s supposed to be hard, at first. She doesn’t have to live in a posh apartment complex, just a safe one. He doesn’t need all new furniture; something clean, serviceable, and not hideous is all that’s required in the beginning. 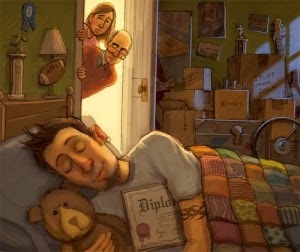 Have a Game Plan— In an ideal world, when adult child graduates from college, she is ready to claim a place in society. An apartment, a job, car, and understanding of fiscal responsibilities are all necessary to cope as an independent adult child. However, most of us don’t live in an ideal world, and due to any number of possible circumstances, your adult child isn’t quite able to face these challenges with confidence and independence. What to do? Well, first of all, unless you want a 35-year-old daughter taking up space years from now when you’re ready to retire, you’ve got to make a plan. Some people may subscribe to the “Tough Love” approach – that is, no more money from parents once he’s got that diploma is his hot little hand. A bit ruthless, maybe, but chances are if you’re reading this, it’s not the option for you or your newly independent adult child. You do, however, see the benefit of weaning her from your bank account before she gives you grandchildren, so a plan is definitely in order. Move It On Out— In addition to this financial meeting, you also need to decide how long your welcome mat will be out. Discuss with your adult child how long he feels the need to continue living at home. For many individuals, the idea of having to pay bills to one’s mother and father is enough of an impetus to get us out the door. For others, though, it’s not, and some incentive (like a deadline, not a cash reward!) is required. The Small Stuff— If you’re going to help your adult child learn to do things on his own, a “small stuff” approach may be the answer. If he hasn’t gotten his “dream job”, encourage him to get a job that can at least pay the bills while he’s looking. If he’s still living at home, charging rent, a portion of the utilities and part of the grocery bill is appropriate. Sit down together with your wife (or girlfriend) and decide AHEAD OF TIME what you want your adult child to pay for. These expenses are not negotiable; present them to him as ironclad. Flexibility in what he pays for will not teach him anything. The landlord of his first apartment will not care whether or not he had enough hours on the clock this month to make her rent. Once you’ve decided on the minimum requirements, sit down together and go over your expectations. Make sure to present your offer in a rational manner. YOU are the owner of the house. YOU are in charge. And it is your duty to help this adult child get out on his own.